is a great thread locking compound that I used on all the nuts and bolts. 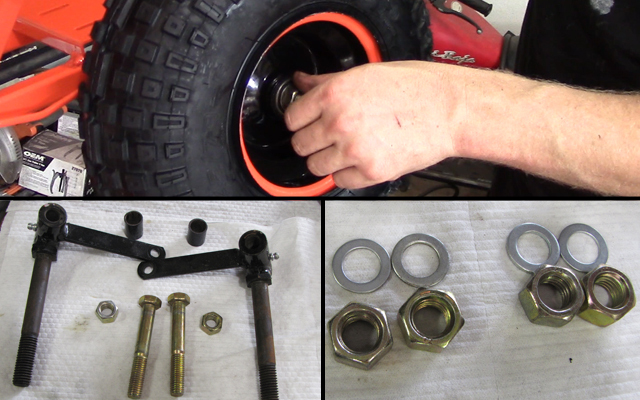 Mount the tires to the rims, insert the 5/8″ ID x 1 3/8″ OD bearings into the rims. Tip: To avoid breaking the bearings, use a socket or small piece of pipe mated against the outer race of the bearing, then gently tap the bearing into the rim with a hammer. 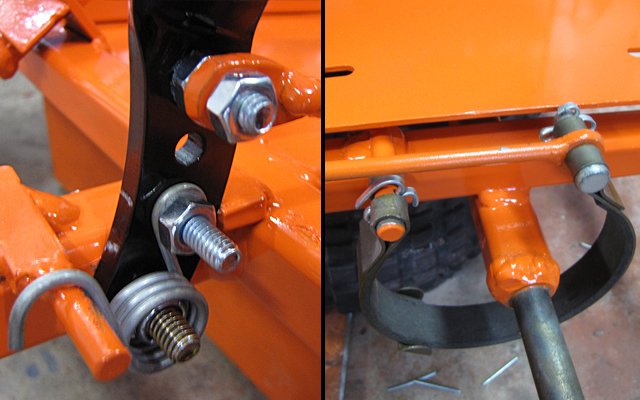 For the front tires, you will need to bolt the spindles to the spindle brackets. 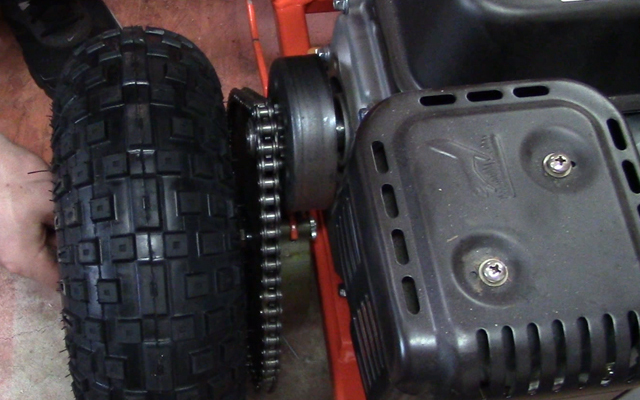 Next, insert the 5/8″ ID x 1″ wide spacers to keep the tires from rubbing against the spindles. Next comes the tire assembly, 5/8″ machine washer, and 5/8″-11 nut. Do not over tighten the nut. The wheel should spin freely without the bearings binding. The thread locker will keep the bolt and nut secure, so finger tight is perfect. For the rear tires, you wont need spacers (only the rim, machine washer, and nut). Install the four bolts and nuts onto the engine for the mounting, but don’t tighten them all the way. Next, install the clutch, fender washer, and bolt for the engine shaft (don’t forget the 3/16″ key on the engine shaft). 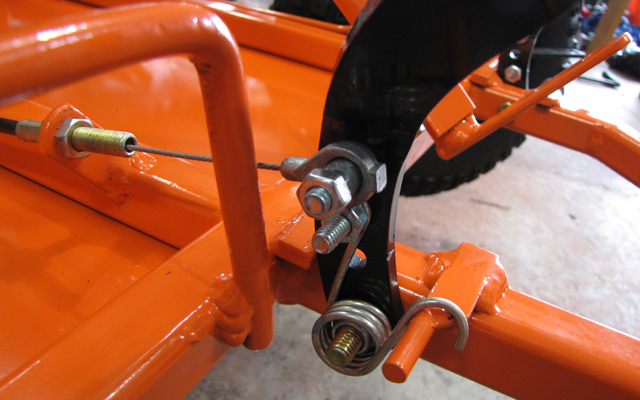 Next, install the chain with master link clip and push the engine toward the front of the kart. Use a straight edge to line up the clutch sprocket and the drive wheel sprocket. The chain tension should have a very small amount of play in it. When you are satisfied with the alignment and chain tension, tighten the engine mount bolts. 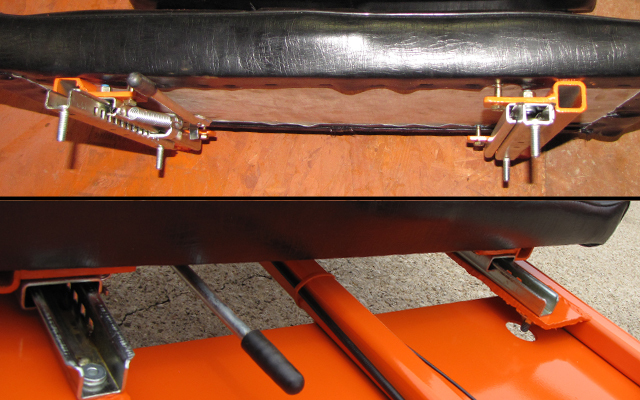 The brake band can be installed during the same step that the drive wheel is installed. Install the pedal, return spring, brake band, and clevis pin. Secure the band with the two cotter pins. Install the gas pedal, throttle return spring, throttle cable, and connect the cable to the engine. Use zip ties to secure the throttle cable to the frame center beam. Bolt the steering wheel to the steering shaft hub. Bolt the the tie rods to the pitman arm, and spindle arms. Take a measuring tape and measure the edges of the rims with the pitman arm pointing upward. Measure the front edges of the front rims, and the rear edges of the front rims. When the steering wheel is ‘centered’ the distance between front rims should be equal on both ends. You can make fine adjustments with the tie rod ends and nuts. 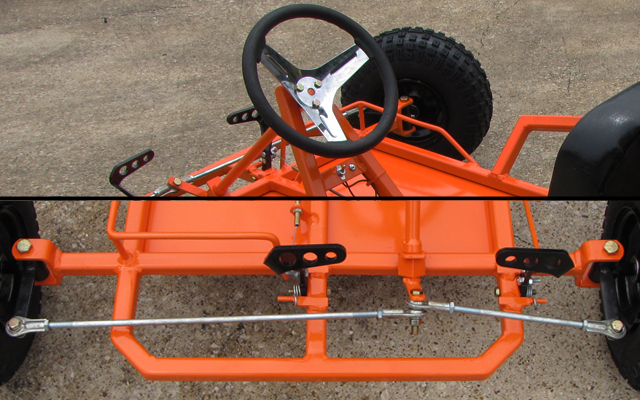 Bolt the kill switch to the steering hoop, and the kill switch ground to the steering hoop. Connect the long wire from the kill switch to the low oil sensor on the engine (replaces low oil cut off circuit with the kill switch circuit). If your engine does not have a low oil cut off circuit, you can trace a ground to the spark plug’s magneto. You can tie into the magneto’s ground wire instead. Bolt the seat to the seat frame. Bolt the seat frame to the seat sliders. Bolt the seat sliders to the frame. That’s right…. your done! Now go have some fun. Always wear a helmet and drive safe. Check out my YouTube channel (KartFab) for more awesome go kart videos. Also, since this is a free build and I have invested a lot of time showing you how to build a kart, the best thing you can do for me is watch the YouTube videos all the way through, comment, share, and give them a thumbs up if you like them. I appreciate all of that, and want to hear any questions, or feedback that you may have. How wide is the finished build? We’re getting closer to completion, and this has been great fun for me and my sons. Everyone who sees the welded frame is very impressed. We bought the Live Axle Plans and I don’t follow the rear axle assembly guidelines. I’m not clear where the locking collars go or how to install the bearings and the flangettes. I’m not even clear how the hangers and bearings work together. This is very new terrain for me, and my sons are eager to get on the road. Do you have any photos of the rear axle assembly? Is there a way to walk me through this in a bit more detail? I’d really appreciate it. I finished final assembly last night. The only issue I’m concerned about is the clutch bolt. The instructions called for 5/16-24 x 1 1/4″. That bolt bottomed out in the motor shaft with about 3/8″ threads still showing. I just installed a shorter bolt and it seems to work. Do you see any reason a shorter bolt wouldn’t work? Depends on how you space the drive unit. Can you make the kart project file available? I think it was done in google sketchup, was not it? I cannot for copyright reasons. 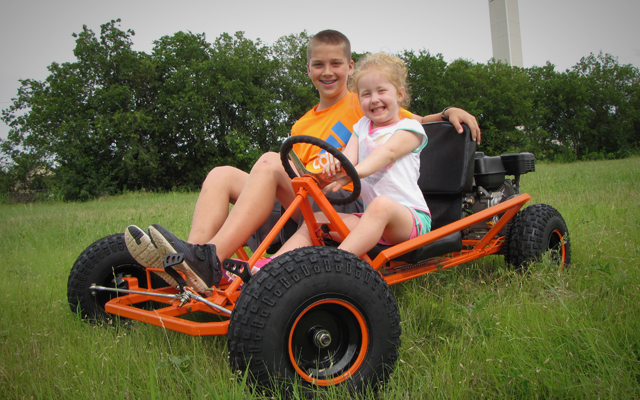 We are building the standard live axle go-kart. We are getting close to final assembly. I’ve read the directions for assembling the rear axle and they make sense, but I have one concern: While each component on the rear axle has locking collars to keep it from sliding laterally, I don’t see any mechanism to keep the axle rod itself from moving from side to side. I suppose that tension in the chain would oppose lateral movement, though it isn’t really intended for that purpose. Am I worrying needlessly or have I missed a detail? the bearings have locking collars on them. The set screws on the bearing collars will secure it to the axle. 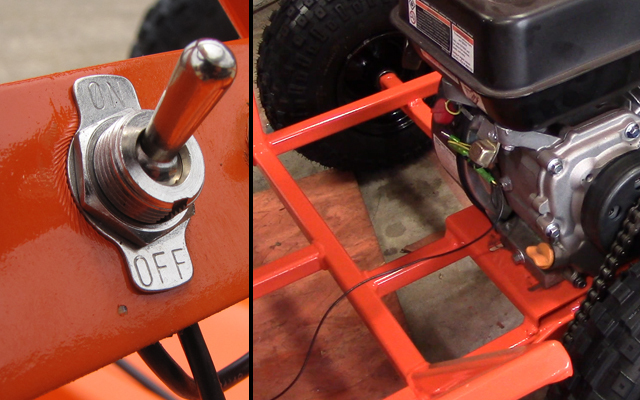 We have been running the go kart for a week with the kill switch working. On the second week we started the engine and noticed it was making a strange sound and we shut the engine off with the kill switch. It appeared the bolt has come loose on the clutch. We reapply the locktite and tighten the nut to secure the clutch. We restarted the engine and the kill switch does not work after tighten the clutch. Can you recommend how I will fix this. Is this large enough for an adult? Or is it just for children? 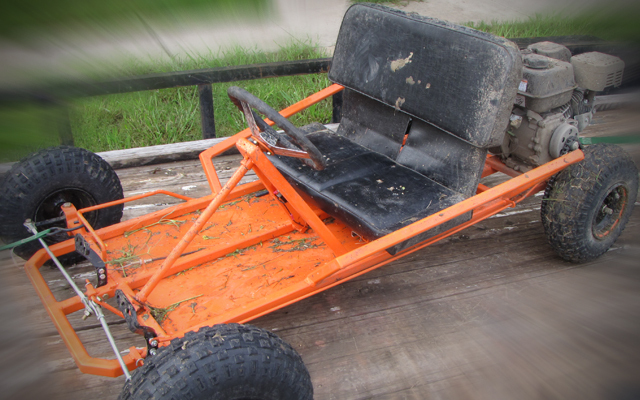 i can ride it and im 6’3″ however, if you want, you can stretch the kart by extending the frame length by 6″ in the middle. What does the engine run on? Gasoline. Just regular unleaded no more than 10% ethanol standard gasoline.